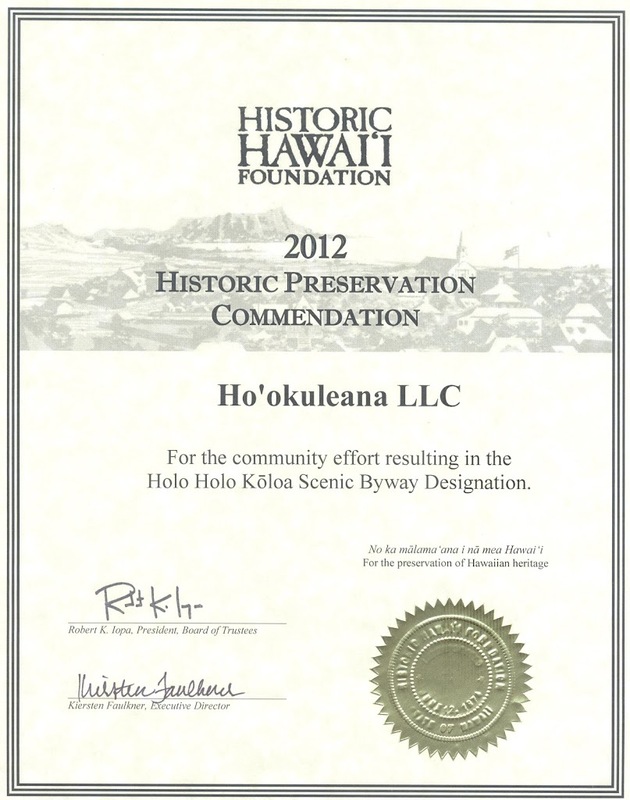 We are proud and honored that the Local Scenic Byway Committee, Mālama Kōloa, Kōloa Community Association, Poʻipū Beach Resort Association and Hoʻokuleana LLC were awarded the 2012 Historic Preservation Commendation for the Holo Holo Kōloa Scenic Byway project from the Historic Hawaiʻi Foundation. Here, there are many scenic, natural and recreational qualities that travelers along the Byway may experience and enjoy. Along the coastal area of Poʻipū there are popular beaches for swimming, surfing, snorkeling, scuba or sunset watching. But the focus of interest along the Holo Holo Kōloa corridor is the region‘s history and the role this area played in helping to shape Hawaiʻi‘s socio-economic past, present and future. Holo Holo Kōloa gives the traveler a look at the historic and socio-economic evolution of the Hawaiian Islands. Here many “firsts” took place that ultimately guided this transformation. This is a corridor with many stories to tell, under the backdrop of its impressive scenic beauty. Last year, the State Department of Transportation designated Holo Holo Kōloa as a State Scenic Byway. We assisted in the designation process and are now working with the community in preparing the Corridor Management Plan (CMP) for the project. The CMP is prepared to address issues related to management of the corridor, but, more importantly, is used to submit the application to Federal Highways for National designation. State and National Scenic Byways designations recognize roads that exhibit one or more six core intrinsic qualities – scenic, natural, historic, recreational, archaeological or cultural – contributing towards a unique travel experience. There are over 20 primary Points of Interest along the corridor, including Tree Tunnel, Kōloa Sugar Monument, Old Kōloa Town, Kōloa Sugar Mill, several Churches, National Tropical Botanical Garden, various Puʻu and Bays. Archaeological and Historic sites include Kāneiolouma, Kōloa Field System, Luahinealapiʻi (Hapa Road,) Prince Kuhio Park/Hoʻia Heiau, Kihahouna Heiau, Makauwahi Cave, Waiʻōpili Heiau and Keolewa Heiau. We are also very proud of that project; Royal Footsteps received several awards, including Historic Preservation Commendation from Historic Hawaii Foundation; Environment/Preservation award from the American Planning Association-Hawai‘i Chapter; and Pualu Award for Culture and Heritage from the Kona-Kohala Chamber of Commerce. In the coming weeks, I will be sharing some of the highlights on some of the Point of Interest sites that are included in the Scenic Byway.